Located 6 miles west of St. Mary Visitor’s Center along the Going-to-the-Sun Road inside Glacier National Park, Rising Sun Motor Inn & Cabins sits a short drive from spectacular St. Mary Lake and is surrounded by soaring mountain peaks. *All properties open at 12 p.m. on opening day and close at 12 p.m. closing day. No services are available prior to opening day or after closing day. Built in 1940, this 72-unit property is comprised of rustic cabins and motor inn rooms. Renovated in 2015, the inn and cabins are only a quarter mile from St. Mary Lake. There is a full-service restaurant called Two Dog Flats Grill, a general store, and gift shop. 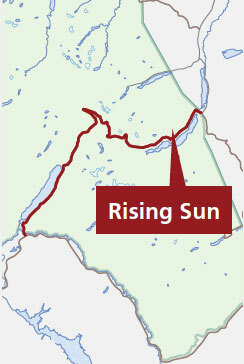 Red Bus tours, boat cruises and hiking are available at this central location. Located 12 miles from Logan Pass. The Motor Inn rooms are located on the hillside overlooking the complex and feature motel-style accommodations with outside room access. Store Motel rooms are motel-style accommodations located in the same building as the general store with a shared interior hallway. Cabin rooms are duplex-style and located along the roadway which winds through the complex. Each unit offers a private bathroom with either 1 queen or 2 double (full) beds. Cooking is not permitted in or around the cabins or motel rooms. In keeping with the era in which the rooms were built, there are no televisions, air conditioning or in-room telephones. There are, however, private bathrooms in all guest rooms. A limited number of ADA-accessible rooms are available and booked based on space available. Only designated guide, service and/or hearing companion animals are allowed in the facilities. All rooms and facilities are non-smoking.